Who are you to do that? I was reading the third chapter of the book that talks about “what to expect when you’re starting.” Starting what, you might ask? Well, that looks different for everyone. For me it’s starting my own web design business and starting a blog in my community to help people save money. For you it could be starting a new job, trying something new, or a plethora of different things that you’d like to do/be. Maybe it’s naive of me but I thought I was the only one that asked, “who are you to do that?” I’ve had low self-esteem for the majority of my life so I thought I was alone. 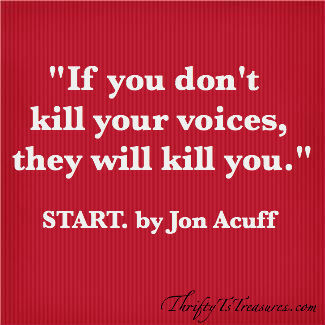 What do your voices say to you? The next time they speak up, stop right there and kill them!